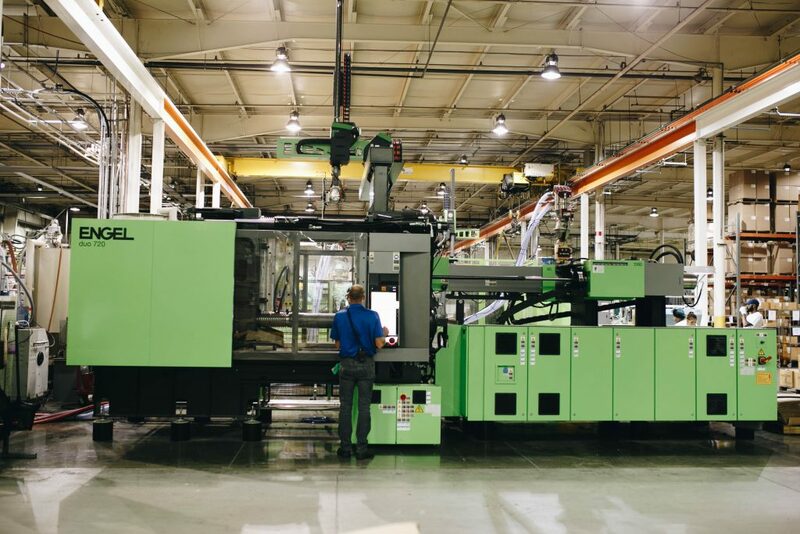 GRAND HAVEN, Mich.– Anderson Technologies of Grand Haven, Michigan has added three new injection molding machines to its fleet of machinery, expanding the company’s capabilities and capacity in an evolving industry. The new equipment includes an Engel Victory 180, an Engel Duo 500, and an Engel Duo 720. “It is important to remain committed to investing in new machinery and technology,” said company president and owner Glenn Anderson. “Anderson Technologies is ready to embrace Industry 4.0 technology as we continue to offer injection molding services on the cutting edge.” This year, Anderson Technologies has invested close to $2.5M on capital equipment and process improvement technology between both of their facilities. The new machinery offers energy savings of up to 50% thanks to its hydraulic pump technology, which is in line with Anderson Technologies’ commitment to sustainability. With higher injection pressure (exceeding 30,000 PSI), the new machinery allows for the production of thinner-wall products and a better control process. A recent cost analysis by Anderson showed that a 9 x 13-inch part with a .135 wall, when changed to a .063 wall in a higher cost material, will yield a reduction in cost while doubling the production volume. With their newly-expanded capability, Anderson Technologies increases its ability to produce clear, polycarbonate products. The new machinery is already in use at Anderson Technologies’ Grand Haven plant, an 80,000 sq. ft. facility with a staff of ninety. This state-of-the-art facility manufactures products for industries such as automotive, office furniture, lighting, medical and dental equipment, food service equipment, and household appliances. Engel, based in Austria, is a world leader in manufacturing injection molding machines and auxiliaries. The new Engel machinery at Anderson Technologies was manufactured in Austria and assembled in the United States. Anderson Technologies was founded just south of Chicago in 1946. It is now headquartered in Grand Haven, Michigan, and operates an additional production facility in Batesville, Mississippi. To learn more, visit www.andtec.com.